What version of our software do you have? How do I determine this? Is this a new installation, or an update? Did you install yourself or did someone else? Is the data stored on your computer, or on a network drive? Was the download package saved to the computer or run from the download page? Do you have read/write privileges for the folder where the First Reference product is installed? 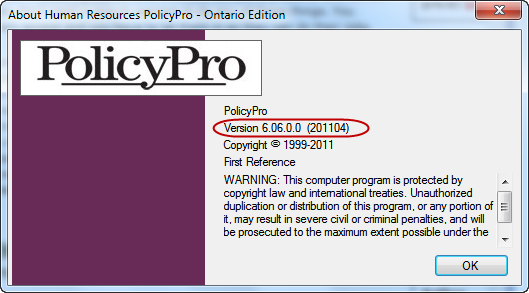 Sample screen shots of the About screen for PolicyPro and HRtrack. Click Help - The Office version is visible under the Product Activated title on this panel. Click Account - The Office version is visible under the Product Activated title on this panel. Users can create screen captures with the Snipping Tool that comes as part of Windows.